The ATP was crippled by another injury episode with its number one player Andy Murray calling it quits for the year, right after his quarterfinal round at the Wimbledon. Andy finished his 2017 season with a 25-10 win-loss record and a title. Andy Murray was ranked number one at the time of his 63 4-6, 7-6, (4), 1-6, 1-6 quarterfinals loss to Sam Querrey at the Wimbledon. Right after that loss, he announced that he’d be missing the rest of the season due to recurrence of a hip injury. Andy started the year with a final showing at the Qatar Open where he lost in three close sets to Novak Djokovic. He, however, failed to carry the momentum into the Australian Open and lost 5-7, 7-5, 2-6, 4-6 in the pre-quarters to Mischa Zverev. However, Andy recovered immediately to win the Dubai Duty-Free by beating Lucas Pouille 7-5, 6-1 in the semis, and Fernando Verdasco 6-3, 6-2 in the finals. The win at Dubai was followed by a string of sub-par results and Andy Murray, as a result, reached only one semifinal in five tournaments. In the French Open, Andy Murray lost 7-6 (6), 3-6, 7-5, 6-7 (3), 1-6 to Stan Wawrinka in the semi-finals. The Wimbledon was Murray’s last tournament in 2017. His Wimbledon prep was somewhat incomplete with the straight loss in the first match at the Aegon Championships to Jordan Thomson of the Great Britain. 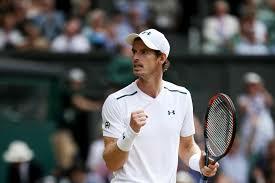 Despite his lack of grass court preparation and a painful hip, Andy Murray managed to reach the quarterfinals of the Wimbledon, where he lost to Sam Querrey in a tightly contested five-setter. Murray enjoys a great personal life and family. He is married to Kim Sears and has a daughter with her. He received his knighthood in December 2016 and is the only tennis player, since Sir Norman Brookes in 1939, to be knighted. Andy Murray ranks just below Roger Federer in the talent department and can play an aggressive brand of tennis. He is an expert at volleying and, unlike Djokovic, knows how to approach the net. He can take the balls early and is quite comfortable with half and swing volleys. However, Murray chooses to stay ten feet behind the baseline and retrieve. He is perhaps the fastest sprinter on the ATP tour, but uses his speed to set-up running forehands, rather than start, reach, and hit early to take time away from the opponent. However, time and again and in the 2012 Olympics, he has shown his aggressive side, and played the kind of tennis which he should play regularly to avoid excessive wear and tear and injuries. Murray’s record against the big three. Andy is 11-14 against Roger Federer, 11-25 against Novak Djokovic, and 7-17 against Rafael Nadal. He has beaten them many times and can beat them again if at his very best. Assuming Andy Murray recovers well and stays injury free in 2018, we expect a productive year ahead as long as he can start playing the aggressive brand of, “approach the net by the 3rd shot,” tennis which, unlike Rafael Nadal and Djokovic, he is quite capable of playing. Playing aggressive would not only increase his chances of winning another slam but also longevity on the tour. What can we expect of Andy Murray in 2018? It is never easy to make a comeback at the highest levels after a hip surgery. With the support of his family and team, Andy, however, could be playing well by the Wimbledon. Andy Murray, if fully recovered, will always be a threat at the Wimbledon and, depending on the draw, US Open. Karolina Pliskova – the ace machine. For the third consecutive season, Karolina Pliskova fired the maximum number of aces on the WTA tour. The 25-year-old fired 452 aces in 69 matches, the only other woman to cross the 400 aces mark, in 2017, was Julia Georges. Karolina, however, fell short of breaking the 500 aces barrier in 2017, which she had crossed in 2016 with 530 and 2015 with 517 aces. Currently ranked 4th in the WTA rankings, Karolina Pliskova was the number one player for seven weeks beginning July 2017. The 6’1’’Czech Republic player had a 53-18 win-loss record and won three titles. She started 2017 on a promising note by winning Brisbane, but couldn’t carry the momentum into the Australian Open and lost 6-4 3-6 6-4 to an inspired Lucic Baroni in the quarters there. She then won her Fed Cup rubbers against Garbine Muguruza and Lara Arruabarrena and then won Doha by taking down Caroline Wozniacki 6-3, 6-4 in the finals. She lost her first match to Kristina Mladenovic 6-2, 6-4 in Dubai. Karolina Pliskova reached the semifinals at the Indian Wells and Miami Open. Her clay season was not as spectacular as the hard court, but she finished it with a semi-final performance at the French Open, where she lost in tight three sets to Simona Halep. Her grass court prep began with winning the Eastbourne title over Caroline Wozniacki in the finals, but she lost in the second round of the Wimbledon. Caroline avenged her Eastbourne loss by taking Karolina out in Toronto in the quarterfinals. Plsikova went down to Garbine Muguruza in the semifinals of Cincinnati and to Coco Vandeweghe in the quarterfinals of the US Open. Her performance levels dropped after the US Open, but she managed to make the semi-finals of the year-end WTA finals, where she went down 7-6(9) 6-3 to Caroline Wozniacki. Karolina plays an aggressive first strike tennis and hits the ball hard and somewhat flat, which makes her prone to inconsistencies and unforced errors. However, when she is on her game, it is quite impossible to contain her aggression at times. Karolina Pliskova is not a good mover on the court and tends to commit too many unforced against retrievers and grinders who send more ball back, than others, into the opponent’s court. Will Karolina Pliskova be able to beat the grinders and win a slam in 2018? Her inconsistencies may even be a result of her movement, or the lack of it, which is exploited by the likes of Caroline Wozniacki and Simona Halep, the top retrievers and grinders of the game. Karolina’s woes against the grinders and retrievers are well exposed in her 2-5 record against Simona Halep, and 3-6 against Caroline Wozniacki as compared to 1-1 against Serena Williams, 2-1 against Venus Williams, 5-1 against Elina Svitolina, and 7-2 against Garbine Muguruza. Karolina Pliskova has come close to winning a slam in the past, and, we believe, she has a reasonably good chance of winning one in 2018. Nadal, after his humiliating loss to Fognini in Monte Carlo, seeks redemption in Barcelona.